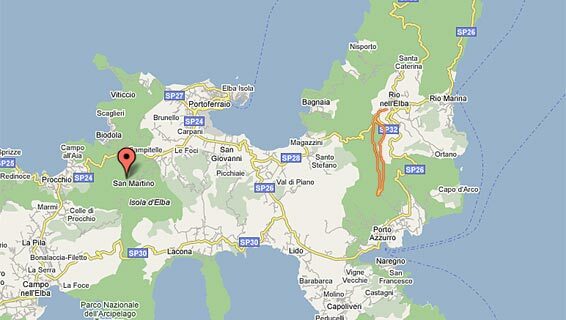 Starting point: Rio nell'Elba (178 m s.l.m.) 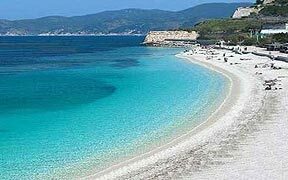 - Arrival point: Rio nell'Elba. From the square in Rio nell'Elba there is a small alley that leads through the village in a short while to Le Panche (327 m., with tables for pic-nic). From here there is a paved road with fine views arriving after 2 km at the slopes of the Volterraio. An uphill track starts from this point and through Mediterranean bush and bare rocks reaches the imposing castle (394 m) in around 40 minutes. It was built when the Maritime Republic of Pisa ruled on these seas, to protect the population of the island from the frequent pirate attacks. A lookout post against assaults from the sea and a hideout in case of aggression, the castle of Volterraio is perfectly integrated among the rocks underneath, dominating the northern side of the island. Once at the top you will notice that time has inflicted indelible marks on the structure but its fascination is still intact: the boundary walls, the stairs to the drawbridge, the wall-walk with the watchtower, the square tower, rooms and vaults, the remains of an oven, wells and cisterns, storages and underground passages, merlons and embrasures. The itinerary returns onto the paved road for 4 km. (to the left at the crossroads) until reaching the pretty Romanesque Church of Santo Stefano alle Trane, dating from the 12th century. Passing by the ancient lime oven a path leads uphill to the main track which continues on the crest connecting the peaks of the east mountainside. 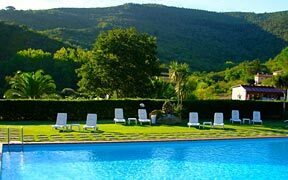 Our itinerary goes north on the ridge, where you can admire extraordinary views embracing the Gulf of Portoferraio, the cultivated valley of Magazzini and, to the south, Porto Azzurro and the east side of Mount Calamita. 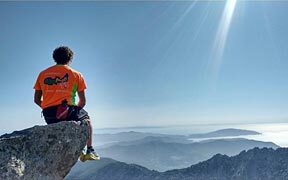 Once you reach Mount Castello (390 m), which dominates the silent valley of Monserrato and the scenic Sanctuary dedicated to the Spanish Madonna, continue to the top of the mountain from which there is a fabulous 360° view on Rio Elba, the abandoned mines, the Tower of the Giogo, the imposing Volterraio, the beach of Barbarossa and Porto Azzurro. 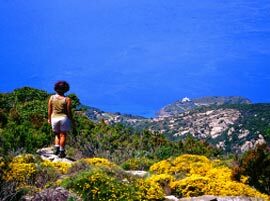 The descent, steep and swift, brings our itinerary back to Le Panche and the stillness of Rio nell'Elba.